How Far is Srivari Vaibhav? Srivari Vaibhav, a residential project located in Kavundampalayam, the project is developed by one of the well-known developers Srivari Infrastructure Pvt Ltd. The project is spread across 2.45 acres bounded by greenery, Srivari Vaibhav provides all the comfort and convenience required by the modern-day families. 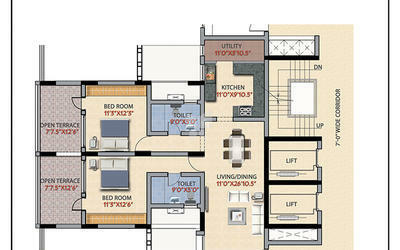 Here you will find 2BHK,3BHK and 4BHK apartments which are designed to fit your lifestyle. These elegantly crafted homes have that positive energy which will relax your mind and soul. 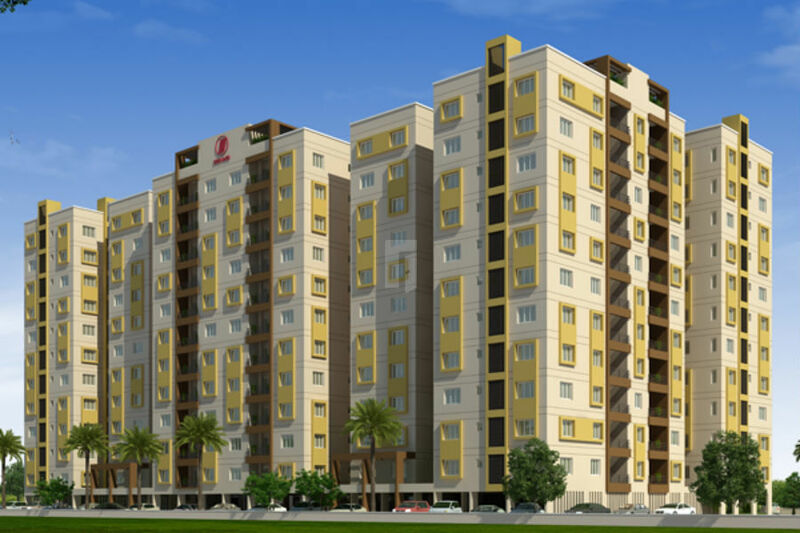 Srivari Vaibhav offers apartments for sale in Kavundampalayam, the size of 2BHK apartments is 1262 Sq ft, 1477 Sq ft and the size of 3BHK apartments is 1746 Sq ft, 2103 Sq ft and the size of 4BHK apartments is 2294 Sq ft, 2420 Sq ft. Srivari Vaibhav has the best floor plans which offer you smart space utilization and provides spacious rooms to spend quality time with your family and friends. Each apartment is designed in such a way that it welcomes ample natural light and fresh air. Along with all these advantages Srivari Vaibhav offers array of lifestyle amenities for the benefit of the residents, some of them are swimming pool, clubhouse, multi-purpose hall, RO plant, intercom, video door phone, gym, indoor games, lobby, landscaped gardens, piped gas, children's play area, rainwater harvesting system and car parking. Framed R.C.C. structure with 9" periphery walls and 4 1/2" thick partition wall. Vitrified tiles in living, dining, bedrooms and kitchen. Marble/Granite/Tiles/ Kota Stone in corridor and on stairways. Coloured granite table top with stainless steel sink and glazed tile dadoing upto 2 feet height above counter. White or off-white colour sanitaryware, granite tabletop washbasin counters, good quality c.p. fixtures like Jaguar or similar, wallmixers, overhead shower. Coloured glazed tile dodo upto 7' height and anti skid ceramic tile flooring. Good quality wood frame for the entrance door and good quality skin door finished with melamine polish and good quality flush doors for other areas - painted. Good quality wood frames for all door openings finished with enamel paint. Elgi, Fenesta or similar UPVC / Aluminium window frames and shutters. Copper wiring in p.v.c. conduits, modular plate switches, MCB/ELCB, adequate fan, light, T.V. 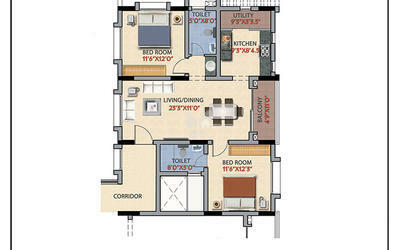 and telephone points and A/c points in all bedrooms. Putty finished surface coated with plastic emulsion. Corporation water supply in kitchen in addition to softened bore well water supply for domestic use. Water softening plant through reverse osmosis will be provided for purifying borewell water. Full power back up for common areas, limited back up for every apartment. Adequate lifts of reputed make will be provided. Car parking space will be provided for all apartments. Srivari Group, One of the well-known business houses of Coimbatore city which was established in the year 1952 by Shri. Bhagwandas G. Lund. In the year 1989, Srivari has involved itself in property development with the vision of transforming the real estate industry. Today the projects developed by Srivari Infrastructure Pvt Ltd stands as an example of excellence and brilliance. Srivari Vaibhav is an example of excellent work done by the group, the project is located in Kavundampalayam. With the help of its group of companies Srivari Property Developers and Srivari Infrastructure Private Limited, the group has constructed many landmarks. The group has involved self in providing landmarks in commercial and residential sectors which has made the group to get a niche and a concrete name for itself in the real estate industry. With years of track record, the group has got the reputation and goodwill because of its transparent way of working and quality work. Till now the Srivari Infrastructure Private Limited has constructed many projects, some of them are in Bangalore and some are in Coimbatore, Srivari Ananyaa, Srivari Saarang, Srivari Gardens, Srivari Mayaa, Srivari Amrit and the list goes on.